Last week we had more snow than ever before. We usually get light dustings, but last week we got deep wet snow. For a land cabin, it's an inconvenience. For a floating cabin it's dangerous. The excess weight can sink the float foundation, and uneven loads can even flip a cabin over. Snow weighs between 4 and 20 plus pounds per cubic foot depending on the wetness and compaction. Ours was about 12 inches thick and slightly refrozen. We have a 40 x 40 foot float with 1600 square feet of surface area including the roof. WOW. Our cabin sank almost a foot! That was enough to cover our cedar log foundation. That's VERY scary! The only solution was to get shoveling. Wayne and I worked all day. 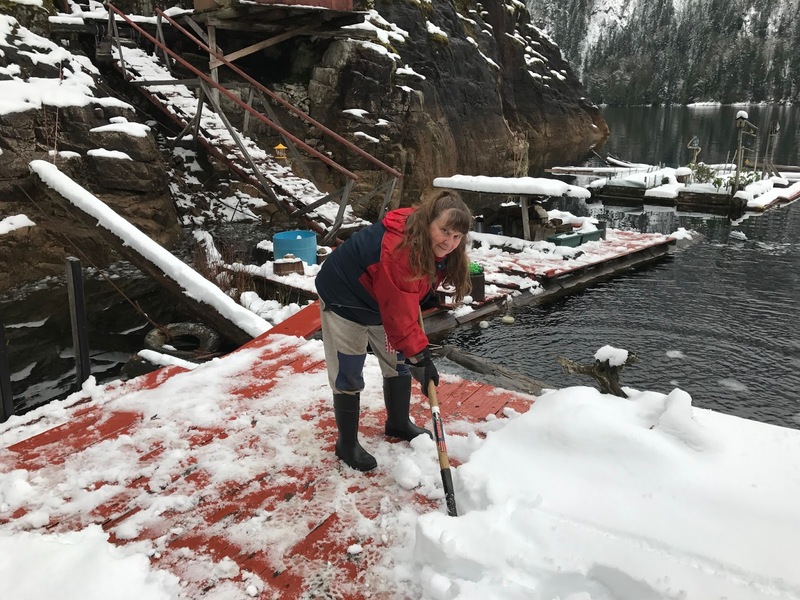 We got most of the snow off of our ancillary docks and the cabin float. We were feeling pretty good until we got more snow that night. The next day we were at it again, removing snow that slid off the roof and the new accumulation. We continued into the following day, but were finally assisted by some sunny weather followed by rain. You shovel sixteen tons and what do you get? Another foot higher and lighter you bet. The crisis is over and float cabin life is back to normal. Whew! Even Mr. Ducky has lost his white parka. Wow! That is scary! Good thing it's back to raining again. OOps that must have been scary.... thankfully nothing really bad happened. Never thought of it like this though, living in a 'normal' house. Oh my! Good job you were on top of it. We lost our greenhouse and despite shoveling our very long driveway were only able to get out twice in two weeks. Apologies for not attending on Saturday-I think our brains had turned to mush along with the snow. if you're ready and used to it. Everything grinds to a halt in the UK when it snows, particularly public transport and services, hmmm! I heard you have rain now!!! Yah, we contend with snow on the roof! Yikes - that is a LOT of snow. I wondered how you were holding up under all the snow we've had. I'm sure you've studied the dangers of snow shoveling and the proper ways to shovel to avoid serious consequences. I'm glad your cabin didn't flip. I remember winters in S.E. Alaska when I was a kid - when we'd have heavy snowfalls we'd have to go down and shovel off our dad's fishing boat. It was amazing how fast it would sink lower in the water in what seemed like a fairly small snowfall - but it adds up quickly. 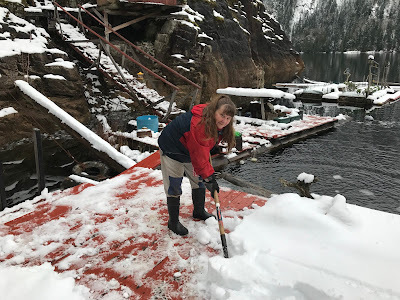 Sometimes we'd even have to go down to the dock in the middle of the night to shovel - and our dad made sure that the shoveling was equal on both sides of the boat - for, as you say, it can flip easily. 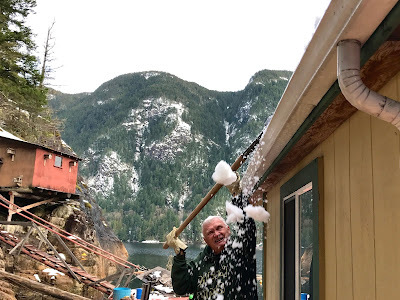 Glad the snow is gone now - we managed by just staying home - Don was off work for three days because the roads were too bad to travel so he worked from home. It snowed on Monday and the previous Thursday in ALB! Actually unusual.